This year, for the fourth year in a row, The Bensman Group employees kicked off the holiday season with an afternoon of helping out at the Northern Illinois Food Bank (NIFB) distribution center in Park City, Ill. About 20 employees helped to sort meat donated by area grocers, discard any damaged meat, package the undamaged meat into 20-pound packages, label the packages and load them on pallets to be sent to the various area food banks served by the NIFB. In all, we packed about 9,000 pounds of food. We originally chose this charity, and we continue to offer our help each year, because volunteering at the NIFB facility allows us to work together as a group, and to make the holidays a little brighter for the more than 500,000 people the NIFB feeds each year. This has become the traditional way we kick off the season of giving. Involvement in our community has been a hallmark of The Bensman Group since our founding in January 1976. In addition to our work with NIFB, we as a company support efforts to help children and families and to promote health care and education, among other causes. Past efforts have benefited Cubs Charities (an annual 100-mile bike ride), the Starlight Foundation, LINKS, the DuPage Children’s Museum and Sinai Health System on Chicago’s West Side. 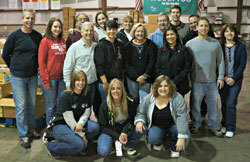 In 2012, we formed The Bensman Group Community Outreach Team, under the direction of Personal Lines Manager Amy Meyer. In addition to the work with NIFB, the team has sponsored a Saturday clean-up day at a Lake County Forest Preserve and a drive to collect holiday gifts for distribution to residents at Winchester House, a long-term care facility in Libertyville. In addition, individual employees serve on the boards of national and local charitable organizations and are very involved in charitable efforts in their own communities. We believe in the importance of being involved in the community in which we live and do business, and in trying to make that community a better place for everyone. We also believe that we are all part of a larger community. As a result, we would like to encourage clients and friends to contribute to relief efforts to help the people devastated by Hurricane Sandy. Many people on the East Coast suffered enormous losses, and they need and appreciate our help. As a precaution and to make sure that the funds are being delivered appropriately, you might want to donate directly through the organization’s website or another verifiable means in order to avoid potential fraud. Robert A. Bensman is the Founder and CEO of The Bensman Group.